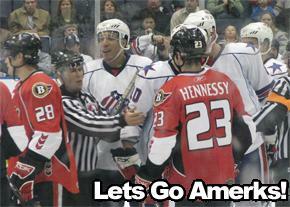 Three Power Play Goals Lead Senators To Victory · Let's Go Amerks! Â Brian Elliott made 37 saves to get a shutout against the Amerks tonight.Â The Senators scored three power play goals in their 4-1 victory over the depleted Amerks. The Amerks totaled 56 penalty minutes during tonight’s game including two ten minute game misconducts, one against Mark Mancari and one against Mike Funk.Â At one point, the Amerks had four men in the penalty box with no room left to spare. The fact that the Amerks are missing many players due to call-ups and injuriesÂ is trulyÂ starting to take a major toll on the way the team is playing.Â They looked defeated before the game even started. With the call-up of Marc-Andre Gragnani, the Amerks are now missingÂ eight players.Â Tanner Glass, Drew Larman, and Rob Globke are in Florida playing for the Panthers.Â Clarke MacArthur, Patrick Kaleta andÂ Marco Gragnani are playing for the Buffalo Sabres.Â Mike Card is still getting headaches from his concussion while Kenndal McArdle is nursing a broken foot for the next few weeks. Adam Dennis also had his 9th straight start in goal tonight.Â Tyler Plante is trying to make an injured shoulder get better fast enough to make a difference for the team but, if it doesn’t take to treatment soon will have to have surgery on it.Â This would bring up David Shantz again from the Florida Everblades.Â Dennis is beginning to show that he can’t do it all alone and will need a break soon. In tonight’s game, Peter Aston dropped the gloves with Danny Bois in the second period.Â Peter was dropped and hit his head on the ice.Â He had a pretty good gash, leaving the game and never returning. The second period was a rough one for both teams.Â There were 19 penalties called adding up toÂ 66 minutes in the penalty box for both teams. Goals for the Binghamton Senators were scored by Shawn Weller (2:00 in the 1st), Denis Hamel (19:16 in the 1st [PP Goal]), Justin Mapletoft (14:02 in the 2nd [PP Goal]), and Matt Kinch (3:22 in the 3rd [PP Goal]). There seemed to be a lot of suspect calls made against the Amerks tonight and many that were not called against the Senators that should have been.Â This led to much of the animosity on the ice. The Amerks are home again on Sunday against the Houston Aeros.Â This is theÂ first of two meeting for the two teams this season.Â The puck drops at 6:05 PM.Â The AerosÂ are 28-22-2-3 on the season while the Amerks are still trying to get twenty wins this season.Â They sit at 17-34-4-4. Coach Randy Cunneyworth is still trying for his 300th win as the Amerks’ head coach.Â Will Sunday be the night?Â Or will the ailing Amerks not have enough players to get a good game going?